This is our main clamping station. 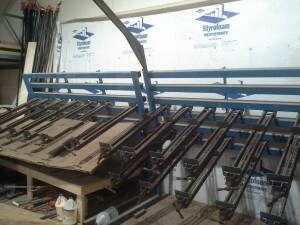 The Southside Woodshop is capable of clamping together almost 400 square feet of wood at once on these clamp racks alone. The answer I’m looking for is (1)…Clamps. Full credit for those that correctly picked it and half credit for those that guessed (4) or (7). Clamps, glorious clamps. They can be used to push, pull, grip, and in a pinch, can also be used as weaponry. Versatile, yes, but when used incorrectly, they can be as ineffective as fortune cookie psychotherapy. 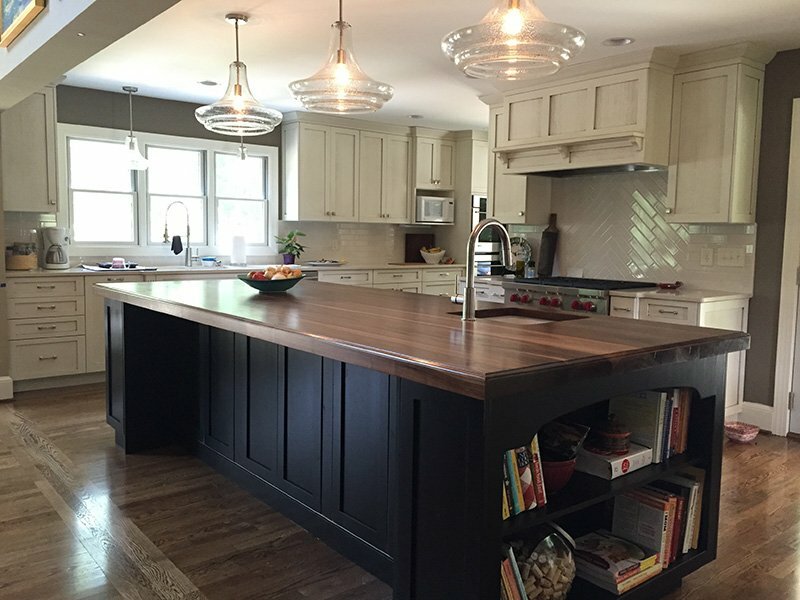 When it comes to clamping wood tops, size matters, but use and placement are paramount to ensure good glue joints that will hold up for a lifetime of use and enjoyment. A lot of life is angles, and clamping is no exception. Clamps apply pressure at 45* angles from their clamp pads so it is imperative that you use enough clamps, or make the glue joint further away from the clamp pads, to cover the joint in its entirety. 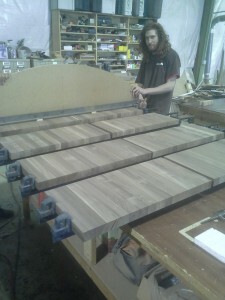 Ryan aka “Ginger Jesus” aka shop foreman Phillips gluing up some smaller edge grain tops that will become a Walnut butcher block end grain island. Here’s an example of what not to do. 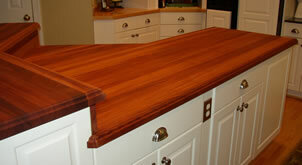 Blame the new guy, I know, but we had this tiny top to build and assigned it to the new guy. Unfortunately, the experienced guy wasn’t watching the new guy too carefully and the resulting bad joints happened. The first and last glue joint are approximately 1.5” away from the clamp pads. Our clamp pads are approximately 4” long and even at this wide, we still need them pretty close together in order to get good clamp pressure along the entire first joint. 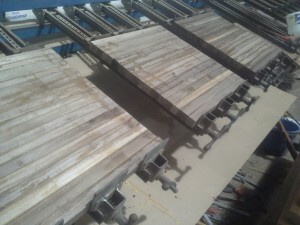 The subsequent joints are further away from the clamp pads so only the first and last joints weren’t properly covered. Luckily, we know a guy (or are the guys) to help fix this. We simply added two clamps to the glue up and moved them closer together so they are able to apply good clamping pressure to the entire first and last glue joints. We could have added blocking to the clamping pads to push the first and last glue joints further away from the clamping pads to create adequate clamping pressure, but I’m much more of a fan of using too many than too few clamps. Why does this matter? Glue joint quality is what separates good products from bad. We’re building our tops to provide a lifetime of use and enjoyment, and guarantee them for life. As such, we’re dedicated to good glue pressure, understanding the fundamentals of glue, wood, and their relationship with one another, and not settling for anything less than perfect craftsmanship. Interested in more? Then drop us a line. Or just skip to the fun part and Request a quote. Here’s a great collection of tips for storing all the different kinds of clamps you need for all types of projects.